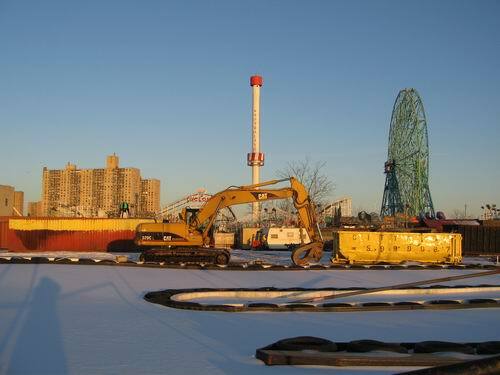 Clearly, demolition crews dispatched by Joe Sitt and Thor Equities made progress before the Valentine's Day Ice & Snowstorm delayed their Coney Island land clearance work. All was quiet on President's Day, although there were a number of vehicles parked on the vacant property and it looks like some of the children's ride on an adjacent parcel are being dismantled. The property in question is targeted for retail development and housing if the developer gets the zoning changes he desires. 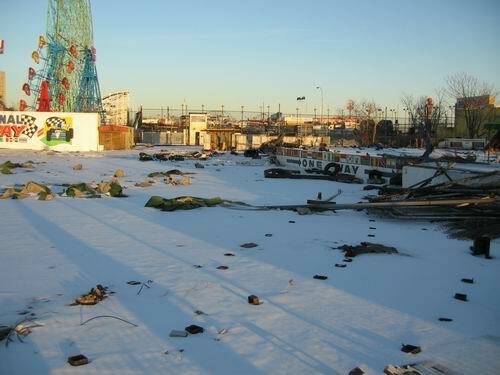 If not, it could end up as part of Coney Island's spectacular collection of land left from previous development and redevelopment plans that did not materialize.